Is the Contractor Licensed and Properly Insured? Before hiring any heating and air conditioning company, ask whether it is licensed to work in your community. Then, ask whether it carries both liability and workman’s compensation insurance. Liability insurance protects you if costly damage occurs due to their work, and workman’s compensation insurance protects you if a worker is injured while working on your property. Any reputable company will be happy to answer these questions. Go to the Better Business Bureau website for your community or the nearby major city. Look up the business name there. You’ll find out whether they are an accredited BBB member and see their overall rating. You’ll also be able to see recent complaints reported to the Bureau and how they were resolved. You can also check reviews on consumer review websites. Use this information as a guide only, and don’t look only at negative reviews, which are sometimes posted maliciously. How Long Has the Contractor Been Doing Business Locally? While a newly established business can be an outstanding choice, a contractor who has been in business for many years generally has developed a solid reputation with its customers. How long a business has operated is just one of the factors you can consider in making your selection. If you wonder about a new business, contact them and ask further questions before hiring them. Does the Company Use Its Own Employees for All Work? Air conditioner systems can often be purchased at big box stores and discount sales outlets. Often, they offer installation services, too. Typically, they pick an installer at random from a list of available technicians. They don’t employ their own technicians, and don’t closely supervise their work. You may prefer to hire a dealer with highly trained, NATE-certified technicians who work directly for the business. That way, you get better supervision and a technician employed by the contractor you hire. Air conditioning equipment, like all home systems, must be properly installed, according to manufacturer’s requirements and local building codes. A poor installation can cause safety concerns and poor operation of the system. Ask about the training and certification of their installation technicians. NATE-certification demonstrates thorough training on these systems and their requirements. Factory training is also a plus, especially for companies that specialize in a single brand. What Brands of Air Conditioning Systems Does the Company Sell? 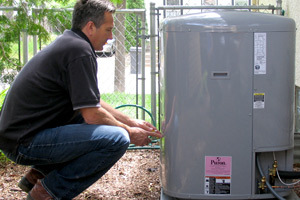 In Houston, Dallas Fort Worth and San Antonio areas, there is a wide range of products from a dozen of manufacturers, including Carrier, Lennox, Trane, Rheem, Goodman, American Standard, Ducane, Comfortmaker and Daikin for central AC products, Mitsubishi, Fujitsu, Toshiba and LG for mini-split heat pumps, and WaterFurnace, ClimateMaster and GeoComfort for geothermal heat pumps. If there’s a brand or brands you prefer, choose a contractor that features and specializes those brands. Many companies are factory authorized dealers for a particular manufacturer, while many independent companies sell and install multiple brands. Brand-specific dealers are naturally very familiar with a particular company’s products. Some dealers offer manufacturer rebates which can mean big savings on your purchase price. Does the Company Offer Free Evaluations and Price Quotes? As a consumer, you should never have to pay for a representative to come to your home and evaluate your heating and air conditioning needs. If a company you contact doesn’t provide this service, contact a different business. After a consultation, you should expect accurate price quotes for a range of options and equipment, with no hidden charges or incomplete pricing. A reputable contractor won’t give you a high-pressure sales pitch, either. Take your time and choose a company you trust for all work. Search on Google and visit websites of Texas companies you’re considering. On those sites, you can learn about the brands and services they offer, as well as additional information about each business. You’ll also get an idea about their business philosophy and professionalism. Additional contact information may also be available on the sites. By doing your own research, you’ll be able to narrow down your list of companies to contact to supply and install your new system. If you make your home in the Houston area, there are many AC companies ready to supply you with excellent products at affordable prices. You can explore our extensive listings in the City of Houston, along with lists of contractors in all suburban areas nearby, from Galveston and Texas City to the south to Katy and Sugar Land on the west. We offer listings, too, from Pearland, Baytown and La Porte in the eastern suburbs to northern communities like Humble, Spring and Conroy. It’s easy to find the company you need in our directory. For Texans living in the extensive Dallas Fort Worth region, finding an ideal, nearby contractor to supply and install your new air conditioning system can be complicated. Hundreds of companies in the area are available. Whether you need a new or replacement system, you’ll find the right business to serve you in our listings. In Dallas, itself, or in Plano, Garland, Irving, or any other nearby suburb, our directory lists plenty of excellent choices. You’ll also find listings in Fort Worth, along with Arlington, Burleson, Benbrook, Saginaw, and all other nearby communities. The San Antonio metro area includes many smaller communities with major Interstate Highway access. Our extensive listings of HVAC companies includes dozens in San Antonio itself, along with dealers near you, in whatever community you call home. Along I-35, we have listings in New Braunfels, San Marcos, Lytle, and many others. If you commute on I-10 from Helotes and Boerne or Seguin or Lockhart, you’ll find local companies to serve you. Our comprehensive directory includes trusted companies throughout the area and makes them easy for you to find and contact. Whenever you hire someone to supply and install a new or replacement air conditioning system, you’re making a substantial financial investment in your home. To protect that investment, it’s important to select a trusted, well-qualified company that specializes in home comfort systems. They’ll sell you the right equipment and do the installation correctly. If you follow the guidelines above and think carefully about your choices and decisions, you can be confident that your investment is a wise one. Before hiring a company to work in your home, you should satisfy yourself about its qualifications and business practices. Our directory of air conditioning contractors identifies companies in your area, but is not a rating system of companies listed.